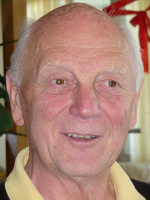 Publications Albrecht Frenz, born in Schwaebisch Hall, Germany, in 1937, was trained in agricultural economics, took his Abitur (A-level) in 1962, and studied at the universities of Goettingen, Marburg and Hamburg. In 1966 he completed his studies of Indology including the subsidiary subjects of Classical Archaeology and Comparative Theology at the University of Marburg and did his PhD. In 1969 he took his examination in Protestant Theology at the University of Hamburg and became a minister in the Protestant Church of Wuerttemberg, Southwest Germany. A year later he got married to Gertraud née Schmid (great-great-granddaughter of Dr. Hermann Gundert) who has often accompanied him on his journeys and who has committedly contributed to his publications. From 1974-77 he was a lecturer for German at the Kamaraj University and at the Tamilnadu Theological Seminary in Madurai, India. There he conducted two dialogue seminars and edited the papers. Together with Hindu friends he translated and published Tiruvasagam and Tirukkural, two well-known early Tamil works. Between 1983 and 1998, in Germany and Kerala, he published Hermann Gundert&apos;s diary and, together with Scaria Zacharia from Kerala, important parts of Hermann Gundert&apos;s huge written heritage, including Gundert&apos;s collection of manuscripts. On the occasion of the Hermann Gundert Conference in Stuttgart, Germany, in May 1993, the Hermann Gundert Society was founded at his initiative, he being the president till 2001. Since his retirement in 2000 he has devoted himself to the cultural exchange between India and Germany. In Jerusalem, together with Scaria Zacharia, he worked on Jewish songs which were once sung by Jewish women in Kerala, and published a German version. In Kodagu, South India, he did fieldwork on the beginnings of the Protestant church and had the results published. Together with K. K. Marar from Kerala he documented murals (wall paintings) at temples in North Kerala. In the region of Madhubani in North Bihar he visited painters and compiled a book on Madhubani paintings. In connection with the inauguration of the memorial dedicated to Herrmann Moegling, Gottfried Weigle, Pauline Moegling, widowed Weigle, née Bacmeister, and Herrmann Anandrao Kaundinya at Ebershalden cemetery in Esslingen, he and Stefan Frenz published the commemoration volume Zukunft im Gedenken / Future in Remembrance. In 2006 Albrecht Frenz was granted the Rabindranath Tagore Cultural Award of the Indo-German Society. In commemoration of Herrmann Moegling&apos;s 200th birth anniversary in May-June 2011 he organised conferences, seminars and exhibitions in Brackenheim, Stuttgart, Esslingen, Tuebingen, Untergruppenbach und Oehringen on behalf of the Hermann Gundert Society. In 2012, 2013 und 2014 he and Gertraud Frenz travelled Tamilnadu, South-Karnataka, Goa and Kerala to scout out the latest developments there as well as to get to know more of Hermann Gundert's former surroundings as well as to be prepared for the commemoration activities for his 200th birth celebrations, which is organised by the Hermann-Gundert-Society and takes place in Stuttgart and Calw during the year 2014. In the biography Hermann Gundert, Monolog - Dialog - Trialog Gundert's life and work is discussed on the basis of the mediative trialogue within the actual social context of migration and integration.